Photo courtesy of: Rick Hamilton / Owner of Drums, Etc. Percussionology is a clinic based program guaranteed to be informative, educational and entertaining to the percussionist and non-percussionist alike. 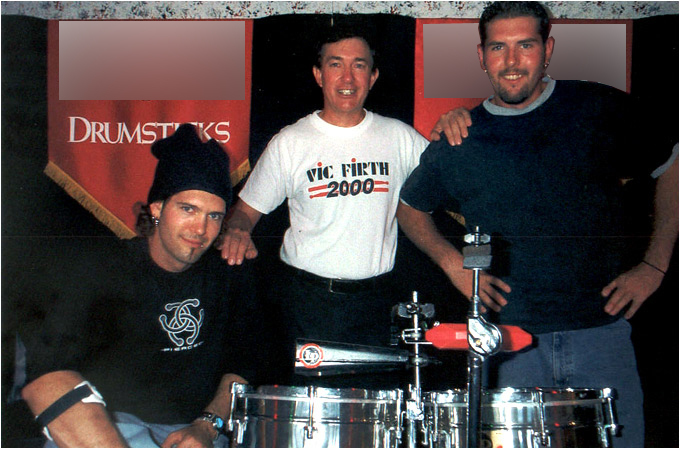 John and his 2 sons, Shane and Jason, who have experience playing and teaching in drum corps, work with the techniques and styles of the drum corps / marching band and apply them to the drum kits. Interesting concepts are derived by applying tenor and snare basics to short drum fills and extended drum solo work on the kit. Basic grooves, important set-ups and kicks that a drummer is responsible for while playing with a small jazz group, big band, rock or latin band are also demonstrated off of these fundamental patterns. Nobody knows that the boys are plants in the audience, and the heckling and comedy takes place on stage as well as off.